New Line is the company trying to take the wacky series that gave us some of the greatest of Don Knotts on-screen moments. 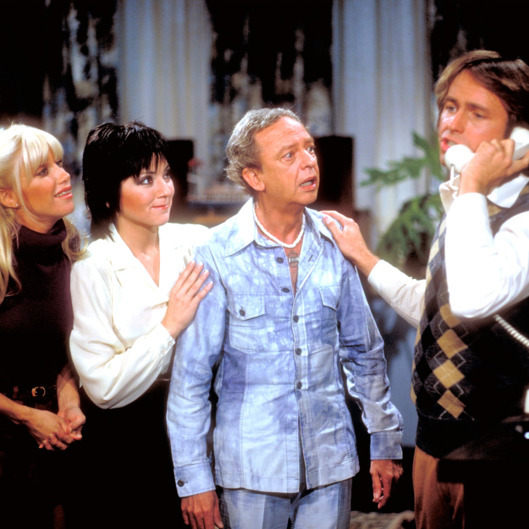 He co-starred in the series with the late John Ritter, Joyce DeWitt and Suzanne Somers. Looks like the writing team of Abby Kohn and Marc Silverstein (‘The Vow‘) will be writing the script that will bring the kookiest set of roommates to the big screen. It’s incredibly early in the project to have too many things nailed down for sure, but we do know what Robert Cort (‘Runaway Bride‘) and Don Taffner Jr. are on board to produce. For those of you wondering if the setting of the movie would be updated to current times or not, we do know that it’s still going to be set in the 1970s. Granted the time frame is necessary because the premise of the show, two girls (DeWitt, Somers) in need of a third roommate ask Jack Tripper (Ritter) to move into their apartment to share expenses. However in the 1970’s, a man living with two girls, with no romantic entanglements would be incredibly taboo, so he has to act gay. Will it happen? Will it not? We don’t have any concrete facts, it may not even pan out. Regardless, I bet that theme song is still stuck in your head, isn’t it? This entry was posted on Thursday, April 21st, 2016 at 5:57 pm	and is filed under Film, News, Television. You can follow any responses to this entry through the RSS 2.0 feed. You can skip to the end and leave a response. Pinging is currently not allowed. « ‘Krypton’ Gets Pilot Order From SyFy!! !